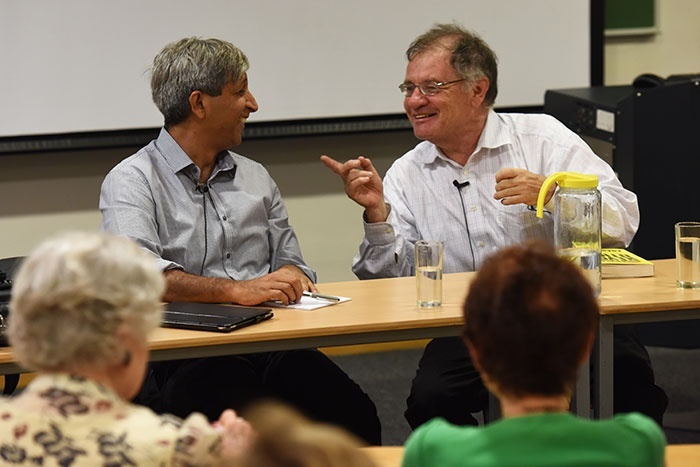 Summer School hosted a lively discussion late last month when eminent academics Professors Dennis Davis and Adam Habib debated key issues relating to democracy and higher education in South Africa. Professor Adam Habib, vice-chancellor of Wits University, and Professor Dennis Davis of UCT’s Faculty of Law discuss issues of democracy, economy and higher education in South Africa, as part of UCT’s 2015 Summer School programme. Judge Davis, a professor at UCT’s Faculty of Law, began by asking Habib, the vice-chancellor of Wits University, whether he still stood by his 2013 statement calling the ANC an increasingly “grubby instrument of enrichment” that paid lip service to democracy and social justice, but undermined democratic institutions. Habib said that while he stood by that statement, it was important to note that South Africa was a far better place today than it was in 1994, and that there’d been “big mistakes” by all sides, including the state and big business. Crises like Marikana and the xenophobic attacks in Soweto pointed to discontent in society and hinted that South Africa was beginning to reach a moment where society could become even more fractured if we couldn’t come up with a second social compact akin to 1994, Habib warned. Habib was quick to point out that South Africa’s situation was not as “gloomy” as its neighbour, Zimbabwe, or as dire as Greece or Syria. He lamented, however, that analysis around the country’s challenges often degenerated into a “good guy/bad guy” scenario. In Habib’s estimation, SA’s structural dynamics are such that there is little danger of a Zimbabwe-like implosion, but he suggested that a key condition that led to social compacts in Europe and Brazil for instance, were visible in South Africa: namely that the elites are in crisis. Poverty was reduced, he noted, but inequality created a perception of polarisation and dissatisfaction. Davis and Habib also considered what the emergence of the EFF could mean for the political landscape. Habib suggested that it might herald a time in which the ruling party no longer took the electorate for granted, as demonstrated by Gauteng Roads and Transport MEC Ismail Vadi ordering a full audit of the e-toll system. On a macro level, Davis wondered what became of the vision presented in former president Thabo Mbeki’s ‘I am an African’ speech, and how those ideals of a “cosmopolitan, non-racial and prosperous democracy, confident of its place in the world” had seemingly fallen by the wayside. Habib commented on how racism was not necessarily worse now than before, but pointed out that both the government and universities had reneged on their responsibility to build the kind of society that Mbeki had envisioned. Expanding on this, Habib described what he saw as a university’s three core tasks. Firstly, universities must provide “fantastic professionals that are globally competitive” and contextually grounded to address global and local challenges. Secondly, they are also mandated to drive critical discourse, both with the academics in their engagement and with the gatherings they held. “I think the third, and most important, is the function of a university is to imagine the very future of the society we aspire to be. And I think that’s where we have fundamentally failed,” said Habib. Many South African universities espoused a non-racial ethos and strove to develop broad-minded citizens, but a few still clung to the notion of racial identities, said Habib, creating a conversation where other racial groups were ‘allowed’ to exist, but one is ultimately dominant. Habib agreed that while UCT and Wits were universities that espoused a non-racial mission, the challenge was to progress from having a philosophical non-racial vision to implementing that vision and achieving those goals. Habib and Davis also pondered the issue of numbers of black academic staff, a hot topic in public discourse. They alluded to possible vested interests that were hindering progress in this area, and Habib opined that these were not from the state, but from within the academy itself. “Are you doing that?” asked Davis. They were indeed, said Habib, to which Davis replied: “Good”. An Afropolitan and cosmopolitan knowledge regime? What about Afropolitanism? Davis probed Habib for suggestions on how to fortify an Afrocentric academic agenda without “throwing the baby out of the bathwater” by completely discarding Western scholarly practices. Habib replied that science was universal &ndash; it didn’t have national boundaries. “But it has to have cognisance of the local context,” he added. So the ‘scientific method’ didn’t need to differ, but perhaps research questions should be tailored to respond to local needs, he suggested. Story by Yusuf Omar. Image by Michael Hammond.